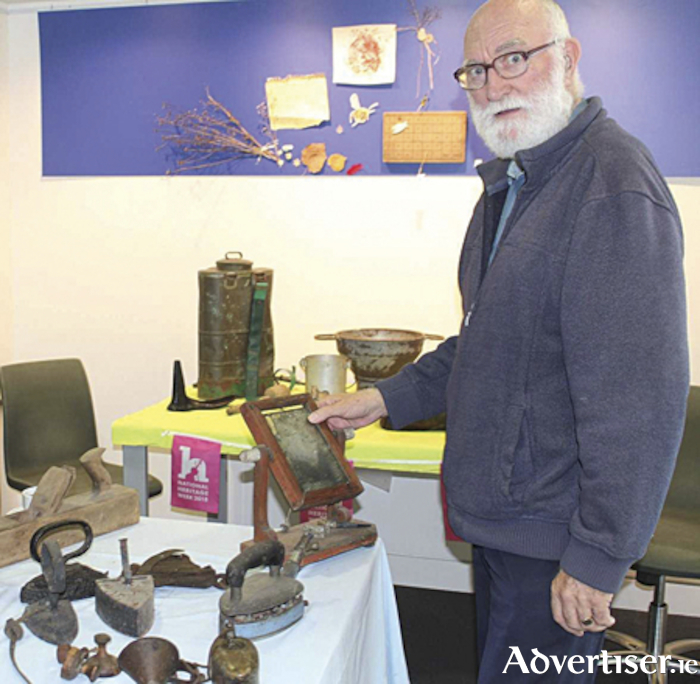 James Dobbie surveys the artefacts on display during Heritage Week 2018. The reminiscence session was held on the August 22 and members of the public were welcomed to join Kathleen from the library to share their memories and stories of days gone by. There were fantastic prompts from the items on display with accoutrements loaned from households in Carrickobrien. These items have often been thrown out as obsolete and disparaged as clutter but they proved essential in encouraging the memories to flow. People shared stories of tasks such as making butter and the nurses bag inspired conversations from jobs to childbearing to families. With visitors from Northern Ireland and Europe as well as locals present, it became a special day not only for sharing memories but also for finding connections. Heritage is something which the nation treasures and the Aidan Heavey Library is delighted to provide ongoing opportunities for people to explore and celebrate their roots. A recent project called ‘Intangible Heritage’ saw workshops facilitated by local artists Michele Fox-Bell and Jill Parkinson. With the support of Creative Ireland and Westmeath County Council, these artists worked with mothers and their children aged from the age of five upwards to explore the environment in which they live. The result was the creation of a series of concertina style books which trace the life and seasons of native Irish trees and a group mural which drew its inspiration from the skyline and heritage of Athlone. This also proved true of the Heritage Week art on display from children who participated in Westmeath Heritage Office’s European Year of Cultural Heritage competition. The Athlone Military History Society meet on a monthly basis in the library with heritage always a popular topic of conversation. They always welcome new members. An additional event forthcoming in the library is a talk on the the Spanish Flu in Ireland 1918-1919 which will take place on September 25 at 7pm. Between 1918-19, the influenza pandemic known as the Spanish flu killed 23,000 people across Ireland and infected a total of 800,000. No demographic group, geographical location or aspect of life in Ireland was spared from this devastating virus. The Spanish flu has been eclipsed in the collective memory by the military loss of life of 1914-18 and remains an understudied event in history despite claiming more lives worldwide than the Great War. One hundred years on, the National Museum of Ireland - Country Life (NMI ) aims to bring focus, discussion and remembrance back on the catastrophe that was ‘the last Irish plague’. Westmeath County library are hosting an illustrated talk on the history of the Spanish flu in Westmeath, which will be delivered by Noel Campbell, Assistant Keeper at the NMI. The hour long talk will cover the spread of the infection in Westmeath, the response of the local population and community services and will assess the final impact on the county, while making reference to the crisis nationally.